We may have stumbled upon the perfect chiffon party dress for all occasions. The Peekaboo Lace Strapless Chiffon Dress will surely impress with its flattering cut and beautiful, understated details. This dress makes a statement without even trying—it is perfect to wear to any upcoming party and would also be a good option for bridesmaids. The Peekaboo Lace Strapless Chiffon Dress is fully lined. It has a strapless sweetheart neckline and lined and lightly padded bust. We love the draped chiffon that crisscrosses at the bust, giving way to the empire waist and flowy chiffon skirt. A hidden back zipper completes this dress. The Peekaboo Lace Strapless Chiffon Dress would look great paired with pumps, strappy heels, or wedges and some pretty jewelry. 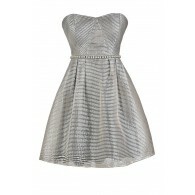 This is a great dress to wear in any season! Details: Made in USA. Fully lined. Lined and lightly padded bust. Hidden back zipper. 100% polyester. Lining: 100% polyester. Hand wash cold or dry clean. Small measurements: Length from top of bust to hemline: 29”. Bust: 32”. 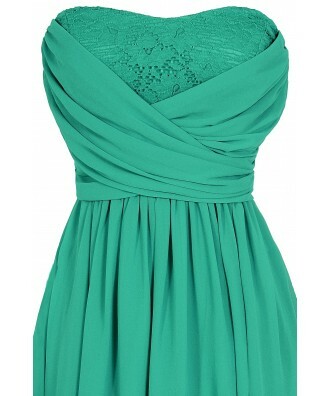 You have added Peekaboo Lace Strapless Chiffon Dress in Jade into Wishlist. You have added Peekaboo Lace Strapless Chiffon Dress in Jade for Stock Notification. You have set Peekaboo Lace Strapless Chiffon Dress in Jade as a loved product. 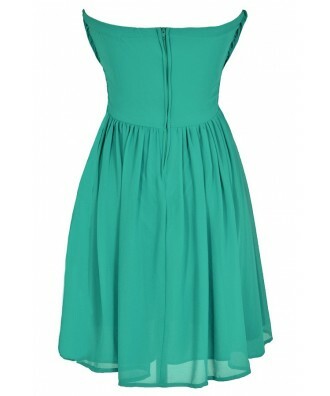 You have removed Peekaboo Lace Strapless Chiffon Dress in Jade as a loved product.